John: There is a Keltic Renaisaance on at present – one branch of that is a form of paganism which is strongly matriarchal. What do you feel about Keltic religion with regard to Druidism or Paganism, or patriarchal and matriarchal forms of belief? that there was ever total matriarchy in this country, although it is undoubtedly true that that was an element in the goddess religions. J: I think a lot of the current matriarchal groups tend to overbalance things in the other direction, which is no better than patriarchy. R: Yes, if one is really concerned about ending sexism, there doesn’t seem much point in letting it go the other way and saying men are all evil. I think the seres are part of each other. J: I’ve been talking to a lot of people about renaissances in Keltic culture, interest in Keltic things. There was one at the end of the last century/beginning of this one – quite a pronounged one -but then that died off in the 40’/50’s. Recently there seems to be a new Keltic Renaissance. But people have said to me, “OK if there is one, it’ll just be another short-term one for about twenty years , then it will die out and there will be a great lapse again.” They said that there is not really time left enough for another renaissance and lapse, renaissance and lapse and so on, because they see the Keltic language, especially the languages, as dying out. If this renaissance, as it were, fails, we might not be in a fit state to attempt another ‘Revival’ containing genuine Kelticness. R: Well they might get a lot of disagreement on that in Wales. Welsh is going from strength to strength at the moment, and Cornish shows every sign of making some sort of resurgence. Breton is stronger than it’s been in a long time, and as for Scottish Gaelic, I mean it was virtually extinct when I was a lad, but it seems now to be doing better than it was then.» I think it shows definite signs of a resurgance. J: I was just wondering about the possibility of a Keltic Renaissance coming which would stick, which would last, catch fire and continue. There could be a resurfacing of something which could then continue for a long time. R: I think it is true to say that civilization runs on ideas, not on bullets, and that culture is founded, usually, on aesthetic ideas, and that someone unleashes some sort of aesthetic force which eventually bocones a city. In the end, all you can detect in history are these markers left by people of vision. I mean you don’t see anything left of the wars….all that is left of the wars…..well the blood just -just drains away into the sand. But the statue with blind eyes is still staring across two thousand years later. J: My ideas behind launching Inner Keltia were to promote this cultural, artistic, religious side, because I see this as being the most important aspect of Keltic culture, and also the most durable, and I think that’s where a lot of the primal inspiration comes from, from that realm, art, poetry, music, religion. Deirdre: “Out of touch with reality”…..which reality, I ask?! J: There1s a Keltic magazine called Carn which in a recent issue talked about the shutting down of a steel smelter in the West of Scotland, which is really relevant, but….I mean….think acceptable, that’s talkable material for the general public, whereas the more esoteric things are not. R: It’s peculiar how often in Scotland you could go up to somebody and say, you know, listen, here we are in the Borders, until the sixth century this was part of Prydain (Britain) it was Welsh speaking, and some of the earliest Welsh poetry was written here, and that would be such news…..it’s never taught in schools. No-one’s ever heard about it, no one’s ever heard of Taliesin, no one’s ever heard of any of those people. Or what the Arthurian connection is to the Borders and why there is an Arthur’s Seat and a Merlin’s Grave and all the rest of it. Let alone any connections Finn MacCuil has to the Southern Hebrides or the Island of Arran…..or Ossian or whatnot. And the real Gaelic side is buried even deeper, the real Gaelic stories are away to Canada and lost with the people who knew what the name of that knoll was, or what that rock in the river was called and why. J: I believe it’s of importance, but what importance do you think there is for modern-day people, out there in the streets, to know stuff about the connections of the South of Scotland with Brythonic-speaking Wales? R: It’s not very important to a lot of people, but it’s important to some, and it’s important that it’s not allowed to be lost, it’s important that people should be able to revoice some of these things from time to time. One doesn’t really think it’s going to be important to a lot of people, but to those for whom it is, it’s going to be extremely relevant. J: 3o in a way you’re almost talking to the few? R: Well, some things you are only going to be able to talk to the few about…..I mean, without being elitist at all, or without even wanting to be – I mean I’d like to be able to talk to lots of people -there are some things you’re only going to be able to say to a few. But they can be worth saying for all that. It’s worth having a go. Deirdre: The trouble is, if you want to make a decent living out of any form of creative activity, you’ve got to become commercial, at least to some extent. will be to get it across. Luckily that is not always true, some-times you can do something that’s really great and get it across, but it then has to retain a lot of communicativeness to be understandable by people. for their very involved poetry, which used a a lot of kennings, symbolic terms, which you pretty much have to be schooled in Bardism to understand. R: Absolutely ….. well there is a Bardic aecret, there genuinely is a Bardic secret, and the reason it is a secret is because you can’t describe it to someone who doesn’t know what it is. What does it mean, I mean what are these people on about? I mean it’s like I’m trying to say in ‘Song of Mabon’, “There’s a treachery hidden in words and human love.” I mean, there’s no way you can describe to someone what that is, unless they know what it means, unless they’ re already aware of that treachery hidden in words and human love. J: How difficult do you find it to incorporate some of these important but, to everyday people, obscure, ideas, obscure terms? R: Well luckily, these things don’t have to be comprehensible intellectually, provided that they have word-music, melody, provided they have musical movement, harmonious content, provided they create a spell. I think these things have a charm of their own. D: Do you think then that these things which you’re trying to express get through to people on whatever level they are able to understand them? R: It seems to be so. I don’t think it matters, because I think that when you get into talking about pieces that are involved with myth and so forth, myth being a subjective thing, it means different things to different people. The pieces as I wrote them have a meaning for me – they might have an entirely different meaning to somebody elae. I don’t think it matters, because it’s the performance of them that is important. It’s the ritual aspect ….. it’s the actual doing of the thing that has meaning. There are extraordinary depths in the Celtic Heritage – I think there ‘s a sort of Renaissance coming in Scotland and Ireland. I’m getting more and more passionately Scottish the older I get, you know, I really want to see Scotland awake. It’s been held under this dark waterfall so long that its fire has been quenched out. Victorian/Knoxian prudery has killed the passionate flower that it should really have been, and anyone looking at Scottish scenery and hearing the best of, say, Pibroch music, can see that there is undoubtedly a very wild soul there, which can still infect even the most mundane hearts with certain forms of •’xaltation. I’d really like to see Scottish art start to wake up to its (quote/unquote) “Celticness” instead of being quite so Tartan cimraick orientated. D: Do you still miss Scotland a lot? R: Well luckily I’ve been in and out of it a lot recently. But yes, I miss Scotland even when I’m here, the Scotland I miss is not here yet. D: Are you still planning to move back here? R: Oh yes ….. oh yes. But I think I will always be a traveller. J: Some of the material you want to incorporate in your muaic/theatre at present is quite serious, involved with myth, involved with symbolism about meaning, about life, about seasons, about things like that, that’s quite a serious content…..
R: ‘Tree of Leaf and Flame” is that…..for better or worse that is what it deals with. But there are a lot of other things I’d like to deal with, including such things as humour, lighter things. J: But even in the performance last night, there was a lot of humour. How much is that a natural expression of your character, or how much do you consciously say, “Well I’ve got quite a lot of serious stuff here, I’d better lighten it up a bit”? R: Well I think in ‘Tree of Leaf and Flame”, I did that less than I’ve ever done in my life. I mean I very consciously perform, you know, but I think it’s a temptation to overdo that, and I think this was the least I’ve ever yielded to that trap. But I do think humour has a definite place…..it’s a marvellous thing…..laughter is very powerful. I like it! Ideally you should have both. Last night was presumably mostly serious, but I think it had its humorous bits. J: Staying over here myself, I’m quite interested in how people in the States approach the celtic field. You know, there are a lot of Highland Societies, Gaelic Societies, Welsh Societies, and so on, in America. We tend to get get bad reports about them, that people are into them because of their name, because their name is Macintosh or suchlike. R: There is that, there definitely is that, but on the other hand, looking on the more positive aids, there is a lot of really sincere enthusiasm, especially in music. For instance, some of the Scottish pipers in the States and Canada are absolutely staggeringly good. One of the best pipers I ever heard was a young American with a sort of German sounding name, from San Francisco, he was great. He was only about nineteen, he was a Pipe Major, and he’d been a member of the pipe band that won the competitions in Scotland the year before. Also some of the Cape Breton fiddlers are fantastic. So there is a lot of enthusiasm, which is very refreshing. One thing I’d like to add: it seems that there has been a sort of pattern over the last few years in my own Keltic Path. The ‘Glint of the Kindling’ album was really about childhood and about growing up, particularly growing up in Scotland, and I then got into this whole thing about ‘Merlin’sGrave’ and the various connections of Wales to the South of Scotland, which I think are very important connections. Edinburgh really is the scene of certain very key events in early Bardic matter, and also in early chivalric matter. So we’ve got the Arthurian, the Chivalric, and of course that leads into the Masonic and what have you …..Knights Templars…..anyway, the next thing from there was, I got into the whole issue of Bardic and Provencal things, Amour Courtois -that’s what the ‘Songs of Love and Parting’ album was about. But I’m currently in a very different state again, having actualized a lot of that. John: The academia world classifies ‘Keltic’ as something from various times BC to about 600 AD and that for them is the Keltic period, and it takes a big jump in their understanding to think that Keltic things have been passed on to the present day. Depending on the individuals scholar’s approach, they’re willing to see Keltic things flowing on. My personal view is that I take Keltic Culture back very much further than a lot of scholara do. the future, I mean I see it asbeing very relevant now, and also not racial. I mean certain elements which I think are Keltic I find in such people as Kandinsky, who has no relationahip whatsoever to Scotland or Ireland or the language movement. DEIRDRE: So you’re really talking about the Keltic Spirit. J: With regard to your personal sources of inspiration in that field, how do you draw from the countries that you visit, whether it’s Ireland, Scotland, Germany or America? I mean when you’re in America, how do you get Keltic things from there? R: Well…..where I am to me is in one sense quite irrelevant. I’m always where I have to be to do what you’re talking about. That has nothing to do with being somewhere in the world – it is not in the world, it’s in the heart. But the other answer is that you can find places that seem to be specially significant tucked away in all parts of the world. I was at this incredible place in Cornwall recently called Modron’a Well – and of course Mabon being son of Modron you know (Robin’s poem ‘Song of Mabon’ has been published in Poetry London – Eds. ), I thought och well, that’ll be an interesting place for a walk. I looked around and couldn’t find it. J: Obviously you have very much realised your aims, to a large extent, and your potential as a musician and a singer. Do you now wish to progress more into the writing field? R: I’d like to try and do as many things aa possible, aa well as possible, in the time that I have left before death, I really think that every second counts. I’d like to continue doing these theatrical pieces very much ( Mabinogion;Tree of Leaf and Flame). There are a number of things that I’d like to do using the theatre and dance. But also I’d like to do some writing. 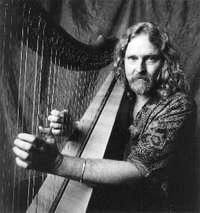 And I’m really very much into the harp. J: When you’re planning a theatre production, how much do you have to take a very tight control of production to make it correspond to exactly what you wish? Or would there be a time when you could just write a score and write a script and hand it over to a theatre company? Do you think there might come a time when you could perhaps do that in California and perhaps send it to a Welsh theatre company to do across here? Would you feel happy about doing that, or would you think that you should have a very personal involvement? R: I don’t know, I’ve never got to the point where…. I’ve never become a playwriter, I’ve only ever written things for myself before really, and the dancers…..are really “pieces of muaic” I’ve written that Geoff Moore has choreographed. I’ve never really written theatre for anybody other than myself. It’s all very much in its infancy. I don’t know…..maybe. D: Do you have any specific plans to bring other art forms into your performances? R: No…..I honestly just try to take things one step at a time, and things seem to present themselves with a variety of possibilities, and I try to do the best I can with those possibilities. You see, what I’m doing now, it’s taken twenty years to get here, and I haven’t got there yet, but it’s coming cloaer to doing aomething I waa trying to do when I was sixteen or aeventeen. But then, I didn’t have the understanding, didn’t have the knowledge, didn’t have the abilities, the techniques, the connections. But gradually one acquires bits of those things…..
J: How much does running your own production – this record company, Flying Fish Records, that you’re on in America, how much does that aid you in what you want to do, rather than, let’s say, being signed on with one of the big record companies? R: Well, big record companies aren’t signing on this sort of things, there’s not really any interest there in the sort of thing I’m trying to do. J: I know quite a few other people who’ve pretty much had to form their own small record labels to do what they want to do. I had the chance to get an approach to this magnificent magazine through Wendy Newton from Green Linnet Records who kindly send me some volumes as a present by the 80’s. 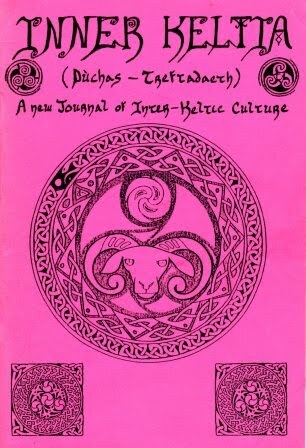 Thus I got acquainted of the outstanding work of J.A.Johnston (also known by his druidic name Kaledon Naddair ) who was it’s editor and reviewer.Besides several articles each volume contained amazing interviews like this one published on Inner Keltia 3 issued on Jan ’83 , and I thought worthy to post. If you wish to purchase more of Kaledon books and works please feel free to visit the official website of Keltia Publications. 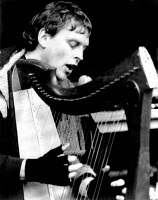 In this opportunity Robin was interviewed by John A Johnston and assistant editor Deirdre Green.To most people Robin Williamson will need no introduction, being popular from the Sixties as a member of the Incredible String Band. Since the dissolution of that group Robin has continued to follow his Muse, first of all with his “Merry Band” and of late in solo ventures. Over the years his sources of artistic inapiration have varied (e.g. Egypt-ian, Gypsy, Troubadour etc. ); the prevailing trend has led him back to his Spiritual Homeland, Keltic Culture. The interview which Deirdre and I conducted with Robin was a very informal chat, no pre-arranged questions and no pre-arranged answers. There was however a notioeable amount of agreement and conoord in the ideas and aentiments expresaed. Indeed if I had concocted answers which I would nave ‘liked’ Robin to have given to ‘set’ questions, I couldn’t have come up with anything better than he actually said in natural conversation. The concord was (i feel) in the main due to the similarity of our Spiritual Paths, and where we’ve reached on them. This was strengthened by Deirdre already being friends with Robin, and I, like Robin, am an Edinburghite Sagittarian so we have many character traits in conmon (a strong creative drive, an indominable sense of humour, counter-balanced by a serious interest in Religious Philosophy and the Hythopoetic Muse). JOHN: I’ve noticed over the laat couple of albums you’ve released that you distinctly wanted your musical productions and creations to be linked to Keltic themes. I was wondering what are your reasons for doing that. ROBIN: Reasons…..it’s a kind of home…..it’s the kind of music I’ve always enjoyed most really, and I always thought there was a tremendous hole in the whole music field and that no-one was writing much in the way of new material in Scottish or Irish folk styles, although there’s a lot of very good playing in traditional styles. But more than that, I also like storytelling, and currently, having looked at a variety of Keltic things, I see myself directly in a literary tradition that goes back through Dylan Thomaa, Teata, Joyce, and through a variety of other things, back to the days when poetry and music were not so rigidly seperated as they are now. 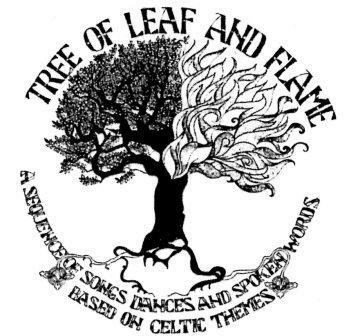 J: The performance you did in the last few days, ‘Tree of Leaf and Flame‘, contained a blend of music, poetry, stories, dance, and even a backdrop of a Keltic design. Have you any further plans to weave those different artistic fields together? year from Midwinter to May to Summer’a End…..and possibly ultimately there’ll be a third piece, from Summer’a End to Midwinter. The idea, of course, of the three dancers and of the storyteller/singcr/harper which I play, has a good solid archetypal grounding. The three dancers is a marvellous image, you’ve got all the Goddeas connections, the Three Graces connotations…..Greek mythological ideas…..and so on. J: I’ve seen similar things done by other people and I was wondering what you felt about using back projection, or film projection, as part of that multi-art approach? R: Well Geoff, (Gooff Moore, choreographer of ‘Tree of Leaf and Fíame’ – Eds.) you are, being a, sort of pioneer in mixed media stuff – all the way through the Sixties he was one of the originator of the whole concept, music, film, spoken word, slides and stuff…..we both felt that it would be nice to use what was a very simple and direct approach to it. So I think that it’s again that sort of Yeatsian No play, a very minimal sort of approach that is exciting. You were asking me what I would do to continue that – the point is, it’s an ongoing project, and next year I’m doing the music for the open-air performance of the Mabinogi which ia being done at Caernarvon Caatle and also at Cardiff, and which ia being taken on on a yearly basis by the City of Cardiff as part of their City Festival. It’s got a cast of fifty. It’s being done in Welsh and English, in the open air, by torchlight, actors on horseback, in the middle of a medieval fair. It’s a massive thing, I’m doing both the live score for the musicians there and the taped stuff, and some of those pieces that we did last night will be included in that.